To the Editor: Hereditary haemorrhagic telangiectasia (HHT) or Osler-Weber-Rendu disease is an autosomal-dominant inherited vascular disease, characterised by the presence of mucocutaneous telangiectasia and visceral arteriovenous malformations (AVMs). Three main causative genes are known: ENG, ACVRL1 and SMAD4. BMP9 has also been shown to be involved in a small number of cases. We report two cases of HHT in North African and sub-Saharan patients. HHT is a vascular dysplasia that affects approximately 1 in 5 000 -8 000 individuals, with regional differences due to founder effects. [2,3] The clinical diagnosis of HHT is based on the Curaçao criteria, including: spontaneous and recurrent nosebleeds; mucocutaneous telangiectasia at characteristic sites (nose, lips, oral cavity, fingertips and gastrointestinal mucosa); AVMs in lungs, liver, gastrointestinal tract, brain and spinal cord; and a first-degree relative with HHT. Approximately 85% of HHT patients have a mutation identified in either ENG (OMIM#187300, HHT1) or ACVRL1 (OMIM#600376, HHT2); and 2% of the HHT families have a mutation identified in the SMAD4 gene, present in HHT in association with juvenile polyposis (OMIM #175050, JPHT). For both ENG and ACVRL1, many mutations have been reported by independent groups in different countries, in most cases without any evidence of a founder effect, which could be suspected only in a limited number of cases. [2,7] As is known, HHT in people of black African descent is a rarity. To date, only one paper reports a mutation (exon 7 of ACVRL1: c.818T>C, p.L273P) in an HHT black adult patient born in Kenya, as Westermann et al. discuss in their letter. The other cases in literature were published before the identification of the two disease-related genes. A December 2012 census showed that the number of immigrants from North Africa and sub-Saharan countries, residing regularly in Italy, for whom the public healthcare service is fully available, is 760 500 and 350 000, respectively. However, a high number of non-registered immigrants are certainly present. The countries of origin of the two patients are those with the highest number of immigrants to Italy from North African or sub-Saharan areas - Morocco and Senegal. We wish to report our observation on two patients among the ~500 index cases, collected by the centres caring for HHT in northern Italy, in Pavia and Crema. The HHT diagnosis was arrived at according to Curaçao criteria. The first case is a patient born in Morocco (regular immigrants: ~501 600) with a 'possible' diagnosis of HHT (2/4 Curaçao criteria). The second patient was born in Senegal (regular immigrants: ~81 000) with a 'definite' diagnosis of HHT (3/4 Curaçao criteria). Molecular analysis of ENG and ACVRL1, according to Olivieri et al.,lm disclosed a mutation in intron 2 of ENG (c.220-1G>C, splice defect) and a mutation in exon 8 of ACVRL1 (c.1232G>A, p.R411Q), respectively. Analysis of exon 3 of ENG, including intron-exon boundaries, covers 20% of the mutations identified in this gene in our lab. The mutation observed is yet unpublished. Analysis of splice sites with SpliceAid (http://www.introni.it/) (Fig. 1) and Human Splicing Finder (http://www.umd.be/HSF/), bioinformatics tools useful for predicting the effect of splicing mutations, shows the replacement of an exonic splicing silencer (ESS) with an exonic splicing enhancer (ESE). Overall, bioinformatics tests suggest that the mutation is pathogenetic. Exon 8 of the ACVRL1 gene carries 24% of the mutations identified in this gene in our lab. 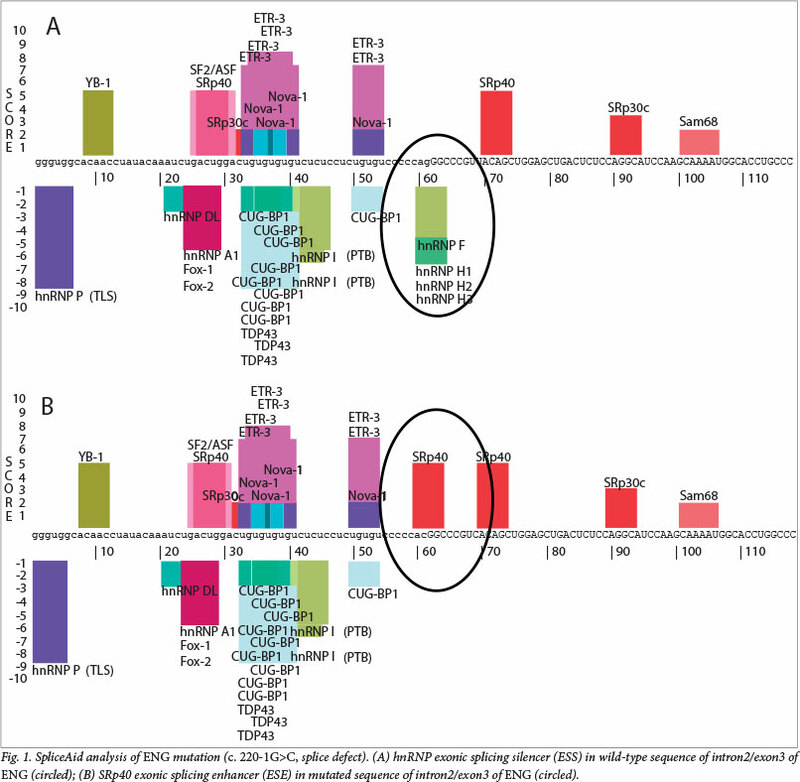 We observed the same mutation in 5/38 index cases from unrelated families and it has also been reported several times in the HHT mutation database (http://arup.utah.edu/database/hht/) in patients from different ethnic origins. Overall, these data support the observation by Westermann et al. regarding the rarity of HHT in patients from Africa. We are aware of the limitations associated with reporting single cases, but we feel a short report of this observation is relevant as data are totally lacking regarding the incidence and prevalence of HHT, and the relative involvement of ENG or ACVRL1 in the African population.